The Tax Foundation calculates the taxes paid per capita, including what is spent by people on average in neighboring states, including state and local fees. The two maps show, first, the tax burden, taxes paid as a percent of income, the second, the difference in the ranks of states in tax burden and in income. 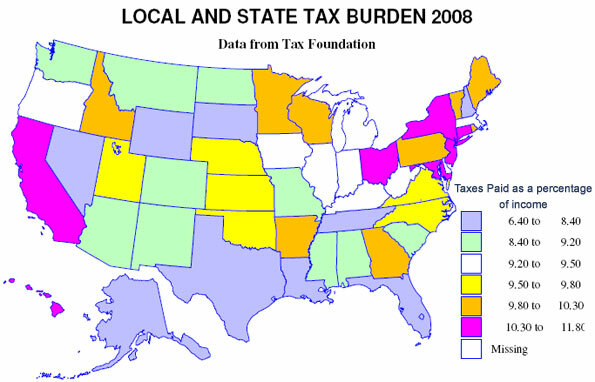 The map for tax burden is colorful, so one might suppose there is a big difference in the local and state burden. There is variation, but the amazing story is how small the differences really are. The variation is from a maximum of 11.8 percent in New Jersey (note that Taxachusetts is in the middle of the pack) to a low of 6.4 percent in Alaska. But most states, 38, are in between 8.6 and 10.2 percent. The lowest tax burdens are not surprising – Alaska (6.4) and Nevada (6.6), but the next lowest, Wyoming (7) and Florida (7.4), may be a surprise. The highest tax burdens, as may be expected, are megalapolitan New Jersey, New York (11.7), Connecticut (11.1) and Maryland (10.8), but Hawaii (10.6) in this group may be a surprise. The states in the middle, besides Massachusetts, include a contiguous set centered in Chicago – Illinois, Indiana, Iowa, Michigan, Kentucky and West Virginia (all 9.3 to 9.5). The modest range of burdens implies that generally richer states have higher tax burdens and poorer states have lower burdens, but the second map shows that there are many exceptions. 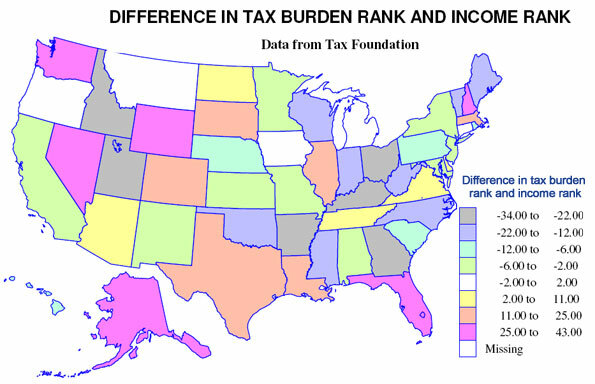 Richer states with higher tax burdens include (a small difference in tax and income ranks) District of Columbia, New Jersey, Connecticut, New York and Maryland, and poorer states with a moderately low tax burden are few – Alabama, New Mexico and Montana. Poorer states but with a high tax burden are Arkansas, Kentucky, Utah and Idaho, but this finding perhaps tells us the statistical problem or risk in using per capita rather than per household measures. Strongly Mormon Utah and Idaho, indeed all four states have high average household size, so are not as disadvantaged as the data suggest. For a similar reason, Florida may not be as good as it looks, since it has a quite low average household size. Most interesting may be the richer states with lower ranking tax burdens, notably Wyoming, New Hampshire, Washington and Nevada. Other states with a relatively low burden (lower tax rank than income rank) include Alaska, Colorado, Florida, Massachusetts, and Texas and other states with a relatively high burden (much higher tax rank than income rank) include Georgia, Kentucky, Ohio and West Virginia. Finally states with close to the same rank in income and tax burden include a set of contiguous Midwestern states, Iowa, Minnesota, Missouri, and Kansas, then Michigan, Oregon and California. But in sum, choosing a state based on its local and state tax burden could be worth the effort, but the effects by themselves could be more limited than commonly supposed. Submitted by davidalan1122 on Sun, 09/21/2014 - 09:36. Submitted by uofix on Tue, 09/16/2014 - 09:41. Submitted by uofix on Mon, 09/15/2014 - 05:15. Submitted by tsflw on Mon, 08/04/2014 - 04:32. Submitted by rdokoye on Sun, 06/30/2013 - 16:33. I really think the government needs to look at alternative methods of funding, instead of relying almost exclusively on the tax system. They tax us for literally everything, and we see very little from what we give. Granted, alternative methods like the sale of resources isn't something that's exclusively within the power of the government. If a country lacks resources, then it lacks resources. Submitted by MaryNicholas on Fri, 03/22/2013 - 21:20. Based on the graph and illustration from above, I can say that tax has been a big help especially to areas where business is also outstanding. Does it have any hostel Malaysia in the said areas? Submitted by babygames8 on Sat, 12/15/2012 - 08:39. In industrial projects, there is hardly a more important component than the gate valve, they are used in most every industry in ever sector. , in the packaging industry. It is specifically used to improve and maintain the weight efficiency of packaged goods. others like to playing game,and bubble trouble is very tricky, you have to use the directions key to go here and there and you can shoot with the help of space key. Every one of us is busy fighting for a better life than they having, and more and more youngsters would prefer to play Car Games example to relax because they are not time restricted and you can play them easily using short breaks between your working hours. Submitted by babygames8 on Sat, 12/15/2012 - 08:38. Everyone's childhood is always associated with her beautiful doll, so cute right? My little girlfriend always play Cat Games when I visit her,especially,before she could reach school age,she like to school Games so much,it is simple and she can learn how to make up to be a school girl! Want to make your children more beautiful? Just search for thegirls dress up Games,you will find millions and millions of model copies to choose from as many parents or girls would have posted the same to help you out.even winx can help you ,too,those girls wear different clothes letting your child learn.